What Should Today’s Library Look Like? Do we need libraries? Could a private business like Amazon replace libraries? What are libraries doing to make themselves relevant in today’s world? Explore these questions with members of the Hartford area library community on Wednesday, August 22nd at the Spotlight Theatre in Hartford. In a recent Forbes opinion piece, the author argued libraries do not have the same value they used to, and could easily be replaced by a for-profit business such as Amazon. Even though Forbes has removed the article, the author’s reasoning is important to explore because this is not a new idea. Libraries all over the country, both public and academic, face the same questions about the role of today’s library. After all, the internet is full of information right at your fingertips and that is all you need, right? Libraries and the communities they serve see it differently. 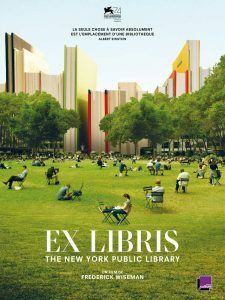 This discussion is what film director Frederick Wiseman wanted us to have when he released the documentary Ex Libris: The New York Public Library. Ex Libris, which will be shown on Wednesday, August 22nd at 10:00am at the Spotlight Theatre, employs Wiseman’s unique style to showcase one of the most iconic libraries in the country – the New York Public Library. The documentary suggests successful libraries depend on partnerships to provide a vital space for education, culture, and community. Here at home, you can look to the example of the partnership with Hartford Public Library and the University of Connecticut. This unique arrangement was part of the University’s move to downtown Hartford, citing, in part, that each institution is working towards the same goal. “Libraries are here to help people solve problems big and small by giving access to the world of information. That is a basic truth for libraries,” noted Anne Langley, Dean of the UConn Library. On August 22nd we invite the community to explore the role of academic and public libraries in today’s digital age with a reception and panel following a screening of the documentary. We will be joined by Ken Wiggin, Connecticut State Librarian; Anne Langley, Dean of the UConn Library; Tricia George, Director of Teen Services at Hartford Public Library; and Tom Scheinfeldt, Associate Professor of Digital Media and Design and Director of Greenhouse Studios at UConn. The event will take place on Wednesday, August 22nd from 10:00am-4:30pm at the Spotlight Theatre, 39 Front Street, Hartford, CT and is sponsored by UConn Hartford, UConn Library, Hartford Public Library, and UConn’s Center for Judaic Studies and Contemporary Jewish Life. The film is being shown in two parts with a lunch break in between. Front Street Bistro is offering a 20% lunch discount for those attending the event. The panel presentation will begin around 3pm. For more information and to RSVP, please contact the UConn Library at homer@uconn.edu.